It's been a number of years since I was last in Celestial Court (天寶閣), and while I enjoyed that meal all those years ago, for some reason I never found occasion to return. I do remember, though, that mushrooms are one of the restaurant's specialties. So when my friend KC announced that he was organizing a dinner there focusing on dishes featuring mushrooms, I wasted no time in putting my hand up. 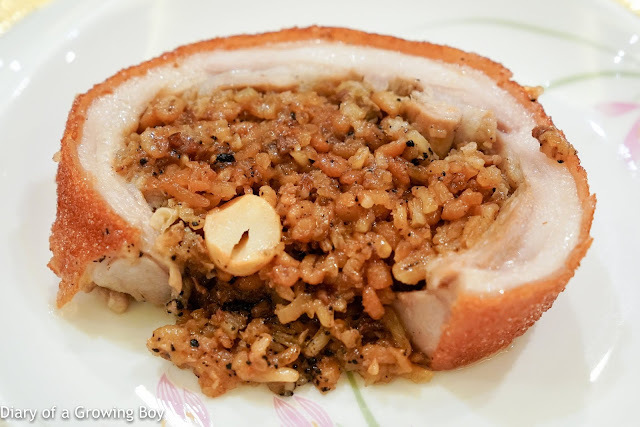 Roasted suckling pig stuffed with black truffle, pearl barley, glutinous rice, ham and wild mushroom (黑松露薏米燒釀乳豬) - BABY, THIS IS WHAT YOU CAME FOR... KC was absolutely right - even though the menu tonight was based around mushrooms, the real reason I came tonight was because I hadn't tasted this stuffed suckling pig ever since it was put on the menu. The crackling was awesome and completely measured up to my expectations. The meat (well... actually the fat) was very springy and tasty. The mixture with rice and pearl barley, unfortunately, was much too wet and mushy. And I didn't understand the rationale for putting lotus seeds in. 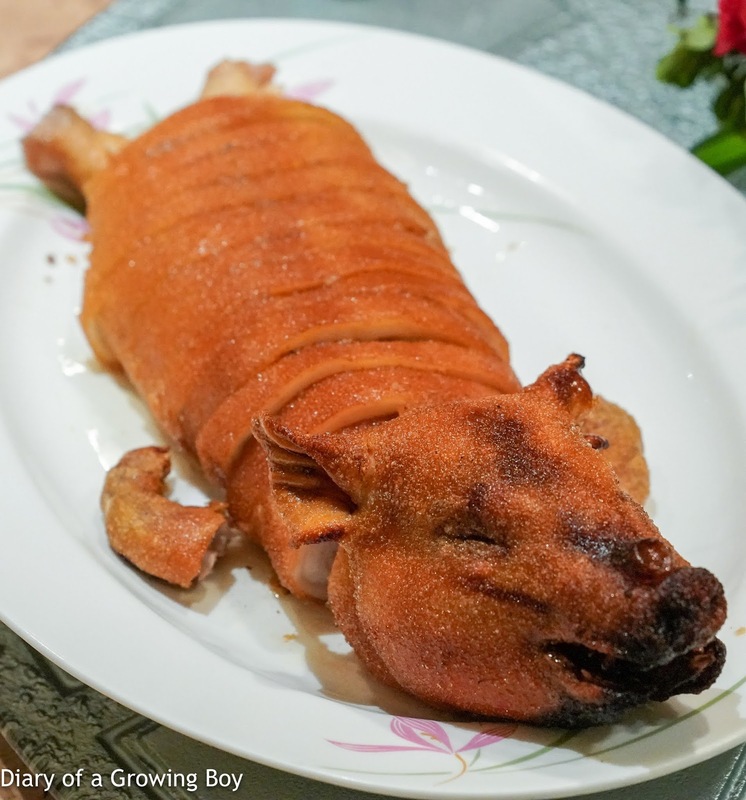 Even though I love the hoisin sauce that accompanied the dish, it was completely superfluous. 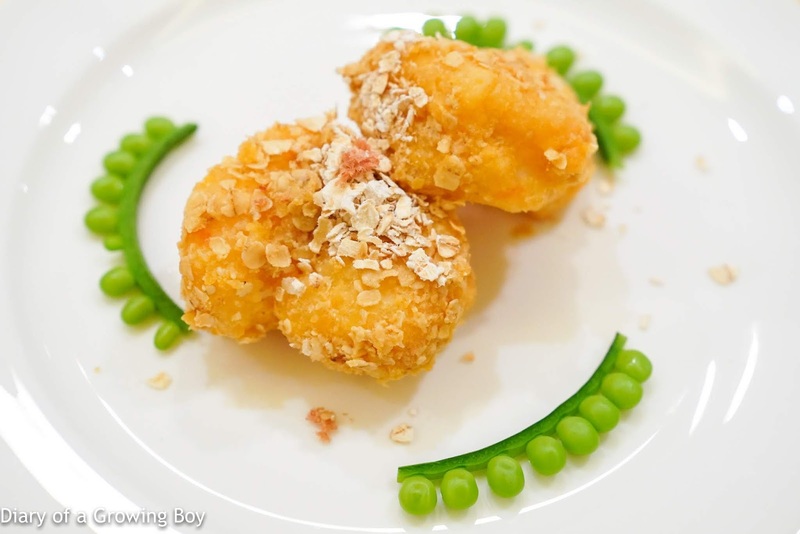 Deep-fried prawn, minced Yunnan ham, oat (腿茸麥香蝦球) - pretty tasty and surprisingly dry coating of salted egg yolk. Not sure why they bothered to put some pathetic instant oatmeal on top. The peas on the side were delicious. 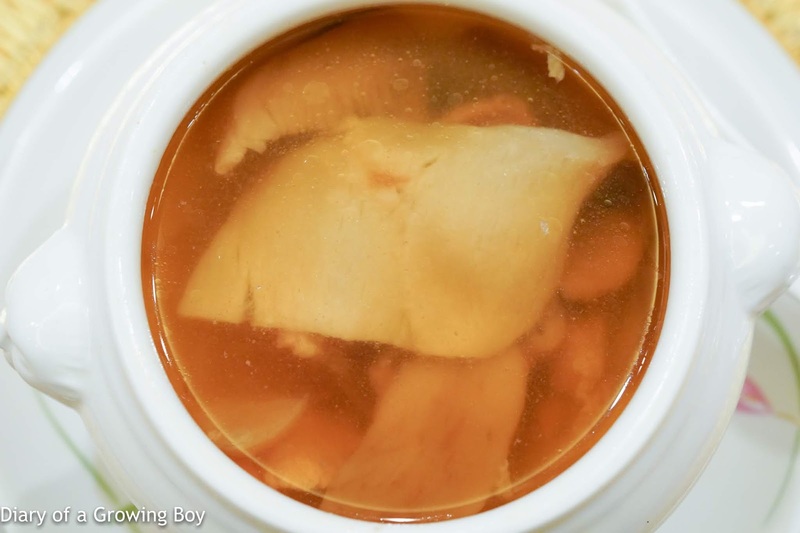 Double-boiled chicken soup with fish maw, matsutake and honey locust fruit (花膠松茸雪蓮子燉土雞湯) - this was alright, although I could never appreciate the subtle fragrances of matsutake (松茸) once it's been dumped in soup. In the end I gave up and left half the bowl untouched, because I didn't really appreciate how much of the honey locust fruit - with all their collagen - filled the bowl. 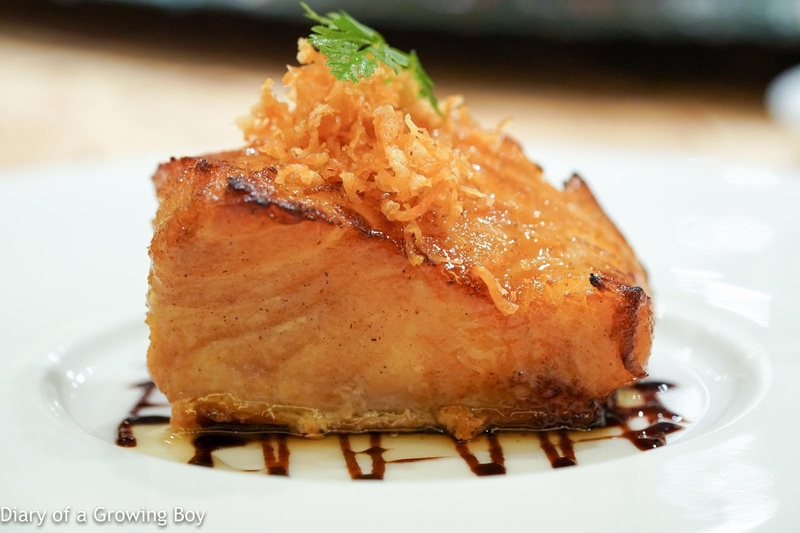 Baked silver cod fish with crispy conpoy (金絲黑醋鱈魚) - this was very good. I've always liked cod, and this worked pretty well with some balsamic vinegar. Beef rib with porcini mushroom (牛肝菌香酥牛肋骨) - this actually came with a deep-fried crust on the outside, and the beef fat was pretty tasty. 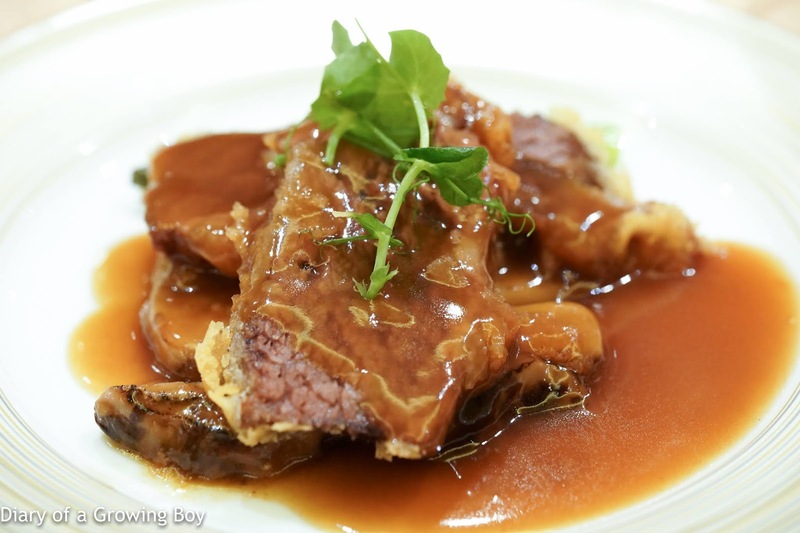 Braised spinach with shredded superior dried seafood (山珍海味扒菠菜苗) - with conpoy (瑤柱), abalone, fish maw, sea cucumber, and shiitake (椎茸). 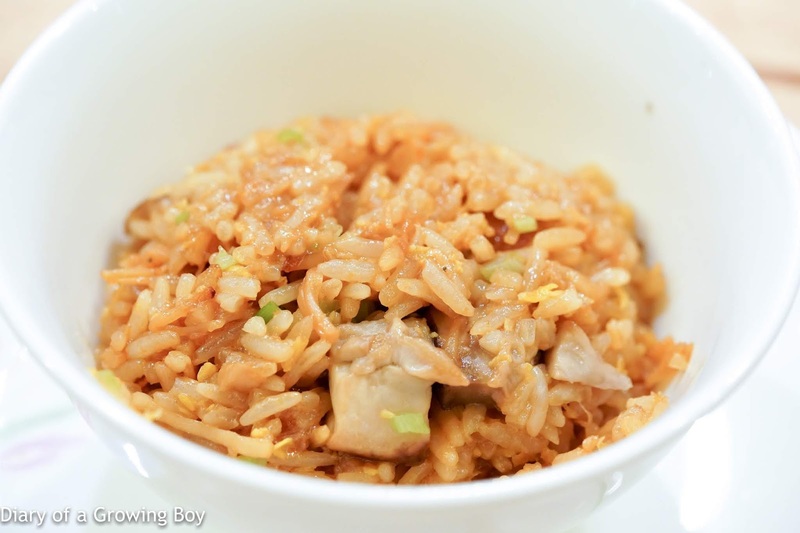 Braised rice with assorted wild mushrooms, conpoy, dried shrimp (野生菌蝦乾瑤柱窩燒飯) - lots of conpoy here. Rice was nice and wet, and absorbed plenty of the sauce. 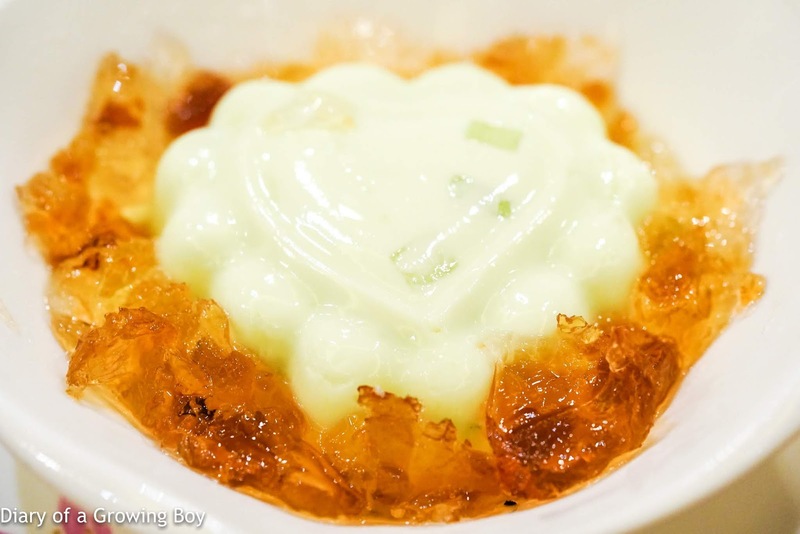 Chilled honey dew melon pudding, peach gum (桃膠蜜瓜布甸) - more gelatin here in the form of peach gum, although I much preferred with pudding made with honey dew melon that included little cubes of melon inside. Since corkage was waived, I decided to bring along a magnum to share with others at the table. 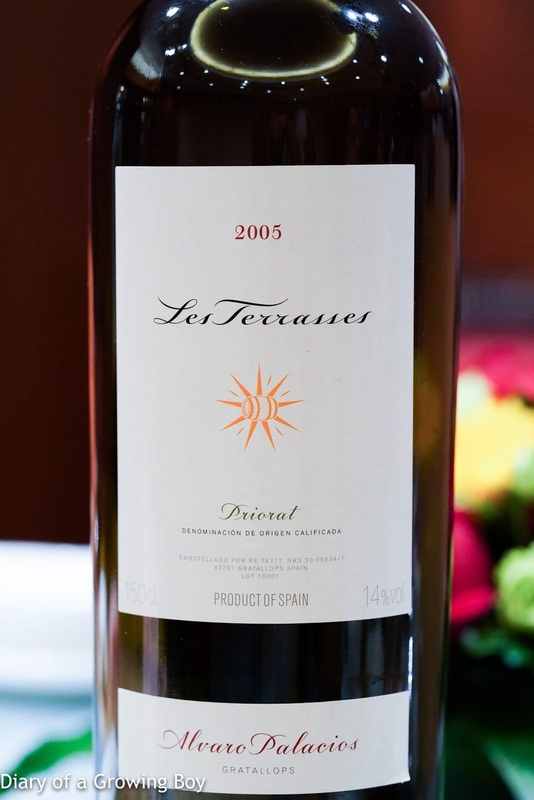 2005 Alvaro Palacios Les Terrasses, from magnum - minty, fragrant, grilled meats, sweet fruit, cigar smoke. Kinda alcoholic on the nose and burns going down the back of my throat.